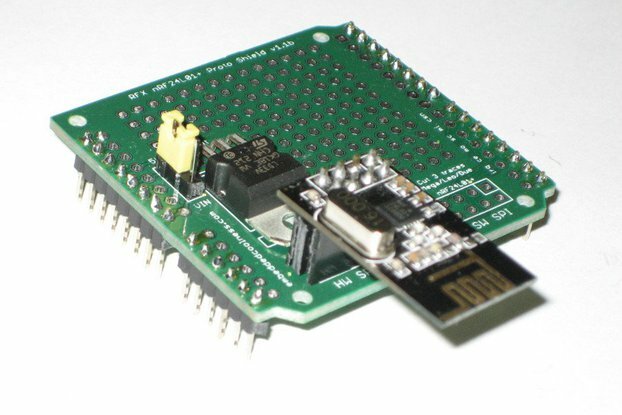 The RFX 328p dev/dep board can be ordered as a bare PCB or a kit. The design is a compact but flexible Arduino Uno-class dev board with built-in nRF24L01+ module headers, and a small but usable prototyping area. The dev board has been designed primarily as a minimalist, low-cost deployment board for wireless nRF24L01+ enabled Arduino projects. 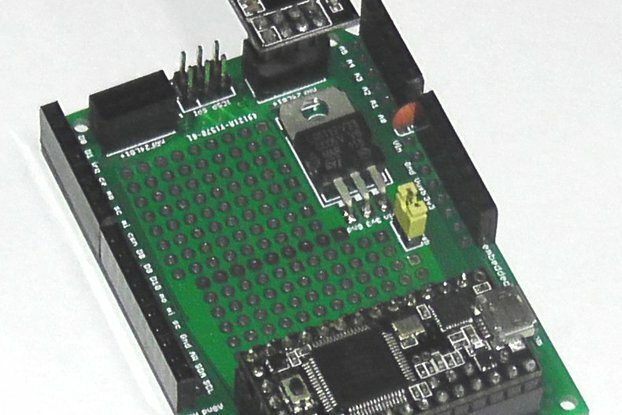 If you are wanting to deploy lots of nRF24L01+ enabled projects without breaking the bank, this board may be just what you need! However, its flexible design makes it useful for economical deployment of non-nRF24L01+ enabled projects as well. There are a lot of features in a small package. It uses all through-hole components, so nothing more than basic soldering skill and equipment is required to assemble it. The default configuration is for a 3v3 board running an Atmel Atmega328p at 16MHz, as it was originally designed as part of the Radio For X:duino (RFXduino) project, as a low-cost deployment board for wireless nRF24L01+ enabled projects. 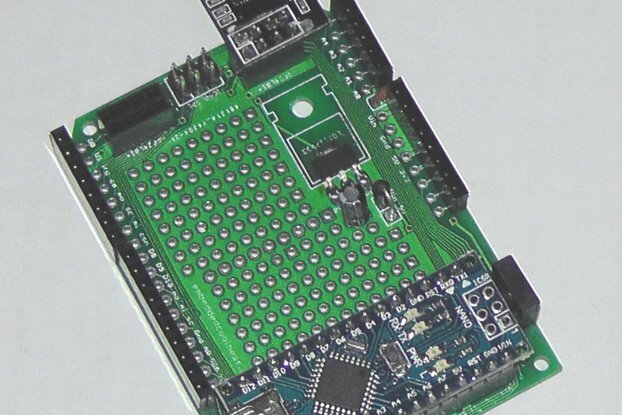 For wireless project flexibility, there is a choice between two nRF24L01+ module connection headers on the dev board: One header connects to the hardware SPI pins D11-D13, while the other header connects to alternative set of pins (D4-D6) for a “bit-banging” software SPI implementation, if preferred. For both headers, IRQ pin is set at D2, CE is D3 and CSN is D7. 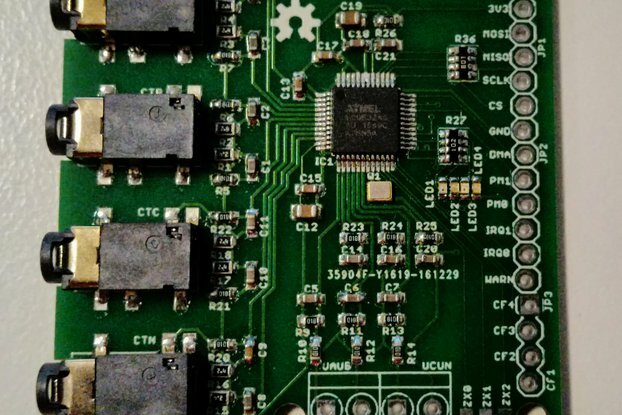 It also has provision for adding a 10uH inductor to the analog section of the power supply circuit, as recommended by Atmel in their data sheets. This is actually an improvement over the Uno circuitry, which doesn't include the inductor (although Massimo Banzi has suggested this might appear in a future revision). Adding it results in a less noisy reading of analog input values on pins A0-A5. Also, we've left the choice of power supply connection open, as there are potentially many ways you might want to do this (battery, dc via header connections, etc.). The photos show a simple screw-terminal block connector and pig-tail lead as one possibility, and these parts are available as an ordering option, but in the interests of flexibility, are certainly not mandatory. So "mesh" or "WiFi" wireless connectivity, it's your call. On the hardware side, the board already provides a small prototyping area, but if you need more for your project, plugging one of these onto a 5cm x 7cm proto board via the breadboard compatible headers is a great way to instantly get a lot of additional prototyping real estate (“great” as in “super easy and inexpensive” :-). 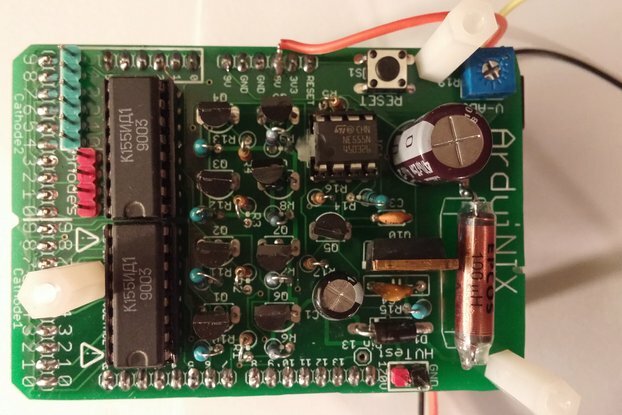 If you prefer to clock the 328p at 8MHz rather than 16MHz, you can either use an 8MHz crystal in place of the 16MHz part, or configure the 328p fuses to use the internal 8MHz clocking option, eliminating the need for the crystal entirely. 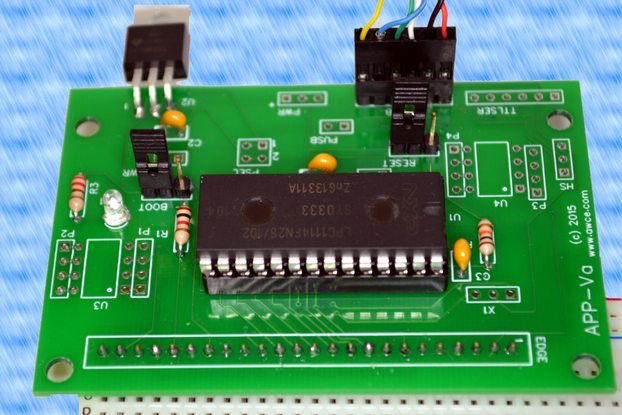 If you want to run the board as a 5V board, just use a 5V regulator in place of the 3v3. 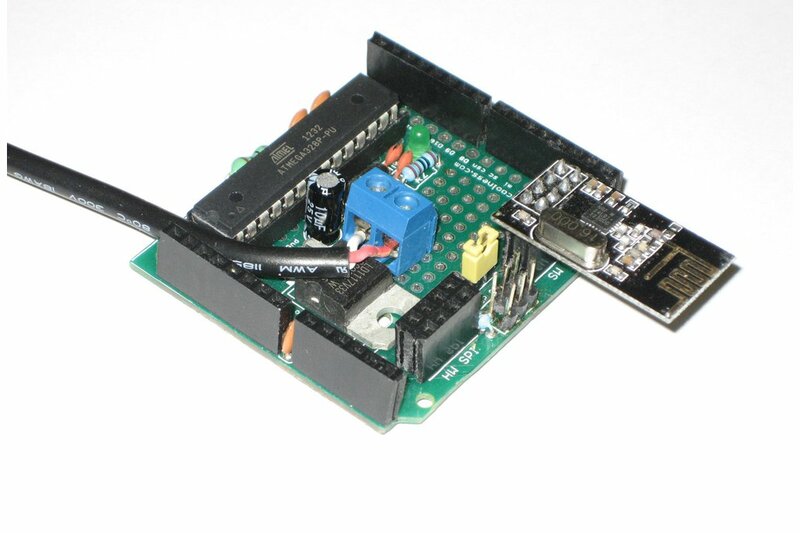 In a 5V configuration, if you wanted to connect a nRF24L01+ module, you would need to use a nRF2401+ proto shield (or equivalent) with it’s own 3v3 regulator (while nRF24L01+ data pins are 5V tolerant, Vcc supply to a nRF24L01+ module must not exceed 3.6V). One advantage of this arrangement, however, is that you get two fairly beefy power supply rails, at both 3v3 and 5V, useful for projects requiring dual voltages. So: A compact and minimalist option for the economical deployment of an Arduino project, offering lots of extensibility and configuration possibilities!